The leader of the rebel Revolutionary Armed Forces of Colombia (FARC), 70-year-old Manuel "Sureshot" Marulanda, met with Colombian President Andres Pastrana in early February and agreed to return to the negotiating table. In return, Pastrana will extend the rebel safe haven ceded to the FARC two years ago until October 9. The peace talks are expected to resume with discussions of a ceasefire, although many Colombians remain skeptical of an actual cessation of hostilities. The two leaders did not announce any agreement on the rebel group's demands regarding the implementation of Plan Colombia--the U.S. government's $1.3 billion aid package. But the government has agreed to form a commission to investigate right-wing paramilitary groups. Andres Pastrana greets Manuel Marulanda. army troops from an area the size of Switzerland in southern Colombia in January 1999 in return for the FARC's participation in peace talks. The talks are aimed at ending 40 years of violence between the government, paramilitaries and leftist guerrillas that has killed 35,000 and displaced more than 1.5 million Colombians in the past decade. But peace talks have been stalled since the FARC walked away from the negotiating table in November, alleging the government is not doing enough to curtail the activities of the paramilitaries. In the past month alone, paramilitaries have been blamed for at least 25 massacres resulting in 184 civilian deaths. Critics of Pastrana's land-for-peace experiment claim that the rebels do not need a safe haven in which to conduct talks if they refuse to negotiate. But the president received a boost in January when thousands marched through the streets of several Colombian cities in support of the peace process, which the FARC said would have ended if the zone had been terminated. In the weeks leading up to Pastrana and Marulanda's meeting, the Colombian army sent reinforcements to the zone's perimeter, including a dozen light tanks and more than 3,000 soldiers. Many Colombians feared a decision not to renew the zone would have resulted in all-out war in this remote Amazonian region. "Pastrana has to renew the zone," said a San Vincente taxi driver. "Or Carlos Castano and his paramilitaries will follow the army into the town and kill everyone who collaborated with the FARC over the past two years." 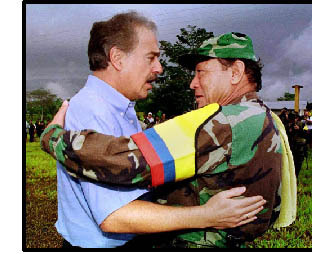 Reputed ties between paramilitaries and the Colombian army have led many, including the European Union and human rights organizations, to criticize the military emphasis of Plan Colombia. Most of the aid is going to the army, with U.S. forces currently training three new anti-narcotics battalions. Fifteen of the Plan Colombia's 60 helicopters arrived in December. The army will use them to combat the FARC in the southern region of Putumayo, where many peasants cultivate coca in FARC-controlled areas. But for the next eight months, the residents of San Vicente will remain relatively safe from the violence that is devastating this country. Says Mayor Nestor Ramirez Valero, "The agreement has avoided a dirty war waged indiscriminately by the paramilitaries against the residents of San Vicente."